Jadeveon Clowney gives the Texans their only realistic chance of pulling off an all-time upset at New England on Saturday night. Nobody on the Patriots can block the third-year dynamo; they’ll have to neutralize Clowney schematically. Fortunately, that’s what this offense is set up to do. Though they threw deep more often (and successfully) than usual this season, the Patriots are the AFC’s top seed because Tom Brady and coordinator Josh McDaniels have mastered the quick-strike game and have built one of the league’s stronger, more expansive screen games. These tactics all but remove pass blocking from the equation. Clowney must make a splash or two against the quick strikes and screens, like he did on his interception last week against the Raiders. But more importantly, the Texans have to put New England in third-and-long situations, where quick strikes and screens become less enticing. Yes, Brady has been phenomenal here (his passer rating on third-and-6+ this season: 129.7) but this is the less potent poison to pick. As with almost every quarterback, you still want to make Brady play on five-step timing and deny him the option of three- or one-step timing. Houston Texans pass rusher Jadeveon Clowney. Creating third-and-long obviously means winning on first and second down. To do this against the quick game, Houston’s corners must disrupt New England’s receivers off the snap (that’s what Denver did so well in last year’s AFC Championship Game). You also need to bat some balls down at the line of scrimmage (J.J. Watt where art thou?). And of course there’s the matter of stopping the run. The Patriots averaged a mediocre 3.9 yards a carry this season, but they ran more than every team except Buffalo and Dallas. The Texans aren’t easy to run against. Vince Wilfork, at 35, can still anchor two gaps and stalemate against double-teams. So can rising 345-pound rookie D.J. Reader. With stalwarts such as these, Clowney, a veritable playmaker against the run, can afford to shoot gaps and take chances. This is how third-and-longs get created. Here the chess match gets interesting. In third-and-long, the Texans’ entire scheme is in play—and you learn why they finished first in total defense. Coordinator Romeo Crennel is shrewd at disguising coverages. Against the Patriots, who employ a lot of crossing routes, the Texans will likely show two deep safeties and rotate one of them down as a “robber,” who can read Brady’s eyes and hunt up receivers. As the numbers show, even in third-and-long, Brady can still be lethal. Which means the other element of Houston’s vaunted scheme becomes even more crucial: the pass rushing disguises. This is where Clowney re-enters the equation. Defensive coordinators will tell you the way to beat Brady is to get him playing fast mentally and hope he loses trust in his protection. When he starts “cussing out his O-line,” as I’ve heard one coordinator put it, things can start favoring the defense. The question is: Do you try to make Brady uncomfortable with his protection before the snap or after it? In other words, do you want to show Brady amoeba fronts, with defenders roaming around in an effort to confuse pass-blocking assignments? Or do you want to keep showing Brady the same front and get him wondering what the rush will look like after the snap? The amoeba fronts might seem to offer more bang for the buck: Why not show Brady different looks and employ different rush tactics? But if you can find a single front that forces all of New England’s O-linemen into one-on-one assignments, Brady then might start thinking about individual matchup problems. That’s how you compromise his trust in the O-line. Crennel has the perfect front to employ “5 across.” This front has become a leaguewide sensation, replacing double A-gap as the third-down look of choice. No one has done it better than Houston. In “5 across” you usually have defensive ends on both edges, defensive tackles in both B gaps (between the guard and tackle) and someone standing directly over the center. This presents each blocker with a one-on-one assignment before the snap. Brady knows none of his blockers can consistently survive the Clowney assignment—and probably not the Whitney Mercilus assignment, either. He also knows that Crennel and this veteran defense could bring any number of the potential five rushers. And when it’s all five, those rushers are bound to loop around on various stunts and twists. This is where Clowney is most explosive, both as the looper and as the guy who attacks blockers in order to set up another defender’s loop. If Rob Gronkowski were playing, Crennel might be more inclined to show amoeba fronts. Sometimes those can coax a quarterback into keeping the tight end in as a blocker. That’s the best way to curb Gronkowski’s impact. But with no Gronk, the guess here is Crennel will show Brady the “5 across” and hope to get the veteran QB’s worry gears grinding. 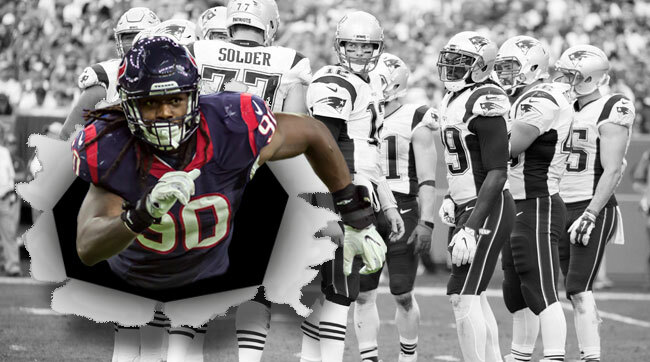 However it plays out, Clowney will be at the forefront. He’s Houston’s only chance at an upset.